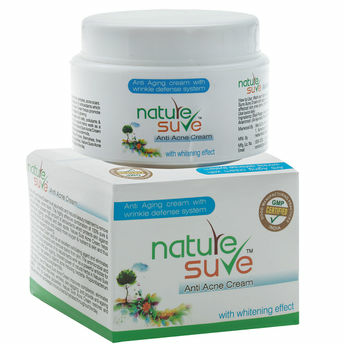 Nature Sure Acne Cream is an ayurvedic and natural beauty treatment to remove acne, pimples, acne scars. The highly effective combination of 100% pure and natural herbs posses high amount of antioxidants which protects skin against premature ageing, wrinkles and dark spots. This cream helps promote blood circulation and supply more oxygen and nutrient to skin and thus keep the skin radiant and glowing. It acts as an excellent exfoliating agent and eliminates dead skin cells, pollutants and remove toxins from skin. The antimicrobial and anti-inflammatory properties of its natural herbs work as a powerful antidote for acne, pimples and skin ageing. Inherent power of natural herbs in it has potency against acne inducing bacteria- Propionibacterium acne and Staphylococcus epidermidis.